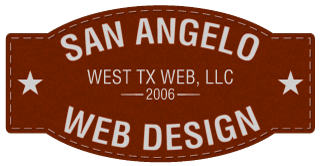 San Angelo Web Design offers multiple pricing plans for website design and hosting. Our pricing is determined by your needs. If you need a ballpark figure of what your particular website will cost, please submit a quote request. For reference, a very basic, 3-page (Home, Services, Contact Us), small business website will cost $400, to build, plus $30/month, for hosting and maintenance. Other services, such as domain registration, social media integration, and search engine integration will add to the cost. People who value our work, as much as they value their own. People who know that they get what they pay for. People who value local, personalized support, over automated phone menus, at remote corporations. Every website we build will be completely responsive (mobile-friendly) and will be optimized for search engines, such as Google. All content (text, images, videos…) are supplied by the client. The quicker you can provide the content, the quicker your website will be ready. If needed, we’ll also handle all of the domain-related technical details, such as transfers and nameserver changes. We can also build completely custom websites, with specialized functionality, like eCommerce, directories, real estate listings, blogs and more. Pricing will be determined by the scope and complexity of each project. Give us an idea of what you need and we’ll give you an idea of what that might cost. There are a few options when it comes to your domain name – you can research and register it, you can research and I can register it, or we can research and register it. Hopefully, you researched available domain names, BEFORE you named your business. If you don’t yet have a logo for your website, we can create one. We don’t use clip-art and neither should you. Today’s logos are simpler and flatter in design, than logos of the past. We have access to a talented, in-house graphic designer who is more than capable of creating a great logo for your business. The “theme” or “layout” of your website just refers to its overall design and how your information will be displayed. Some layout options include “full-width”, in which the pages span across the entire viewable area, or “boxed”, in which there are two blank areas on either side of the displayed information. Most websites, today, employ a combination of both. Your visitors need to have a way to contact you. It’s never a good idea to display email addresses on your website, in plain text. Your contact page will have either a basic or custom contact form, that visitors will fill-out and submit. No email addresses will be displayed on your website. Links to your social networks will be displayed on your website and, separately, visitors will be presented with social network icons for sharing the content of your pages or posts. We lease a dedicated server, through HostGator, which is where your website files will reside. Hosting fees will be billed monthly or annually. Website maintenance includes keeping the software that makes up your website (WordPress core files, themes, plugins…) up-to-date and adding/editing content, when needed. You run your business. We run your website. Installing an SSL (secure sockets layer) certificate acts to encrypt the connection, between the user and the web server. This allows for private transfer of sensitive information, such as credit card numbers. Google is making a push for all websites to have an SSL certificate (secure connection) and will also use this as a factor in search engine ranking.